Renae and the cast rehearsing one of the Slahal/stick game scenes at the En'owkin Centre in Penticton, Syilx territory. 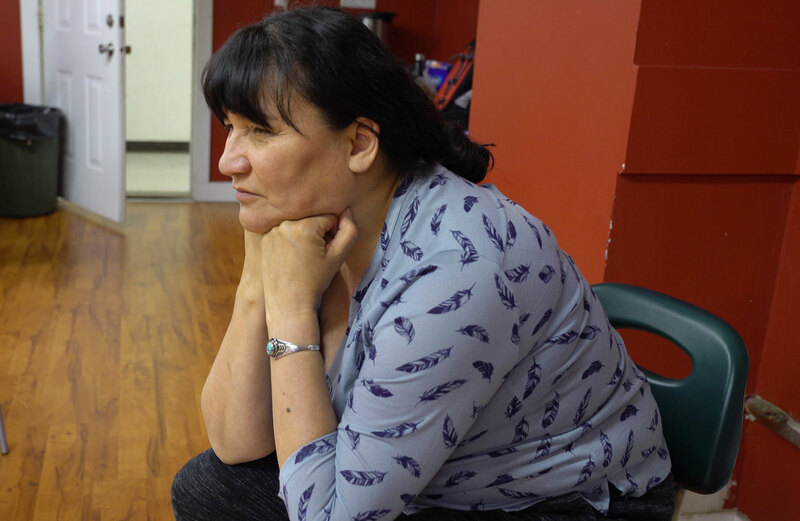 My name is Renae Morisseau I am one of the writers and the director of Weaving Reconciliation: Our Way, and now we’re sitting on Okanagan territory, the En’owkin Centre of the Penticton Indian Band. Can you tell us a little bit about what got you here? Besides your car. What has been the beginning of the story? Of the story definitely. It was sort of a culmination of a variety of interviews Savannah Walling, Rose Georgeson, and I have done over the years, is one thing. Savannah says its like 15 years of this story being made but for me its been in the last I guess 5 years, 5-6 years. The first incarnation being Storyweaving and now Weaving Reconciliation: Our Way. It’s ‘Our Way’ because of the sense that as Indigenous people we’re been reconciling for a long time. 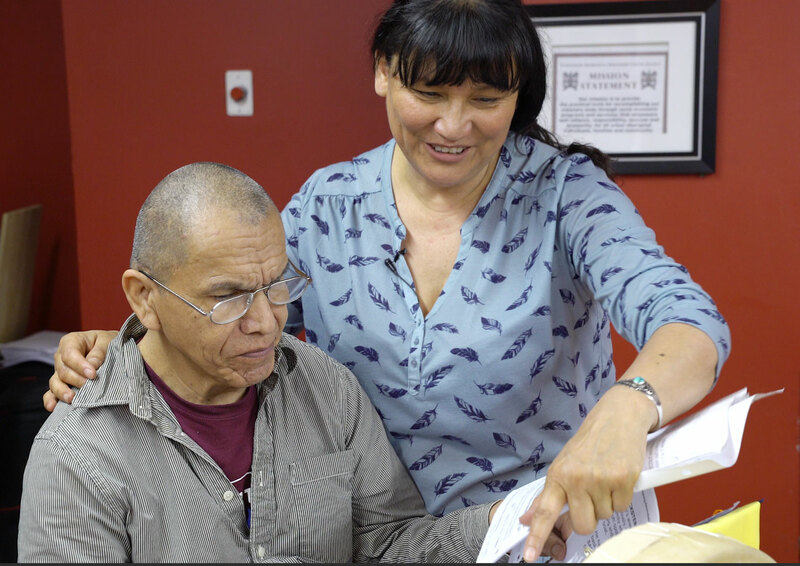 It’s not new to us to reconcile with our families, our relationship with our parents, our relationship with our children in terms of the intergenerational effects of residential school. And this play kind of articulates a journey that a family goes through to come to a place where they feel ok to be parents. This journey is also about the pulse of the current cultural practice of our youth, that the legacy that they’ve been left with, certainly residential school but its also the legacy of how our stories of the land and water, and here in Penticton, here at the En’owkin Centre and the Captikw stories and the four food chiefs, and how those stories and narratives are immersive in their world view- that’s what’s in the paly too. How about you personally, in terms of your own life, what do you think has brought you here to this day? I’ve come to the En’owkin Centre, I’ve taught here over the years, I’ve known Tracey Bonneau and Jeannette Armstrong for over 30 years, oh jeez…more like 40 years, when we were all younger then….So I’ve been coming here for a long time and feel very blessed that because of that long term relationship that I have with Tracey and her family that they’ve accepted our story with such open arms in telling this about our perspectives. And we all know this story so it was an easy fit. Renae directing at the Vancouver Aboriginal Friendship Centre. Renae directing at the Vancouver Aboriginal Friendship Centre with cast member Stephen Lytton. What is your own definition of reconciliation? Have you seen the play? (Laughs) That’s what it’s about. I think it’s a very personal journey that we all have to take. One of the challenges in growing up in Canadian society was that there was always this pre-requisite of what is being a Canadian. And even though I was raised within, never on a reserve, although we are from a reserve, I grew up with stories of my ancestors broken hearts. Songs that weren’t allowed to be sung. So when I was growing up in Winnipeg the legacy that my family left was the whispers of ceremony, and certainly the practice of ceremony. Our Indigenous Cree/Saulteauxways, pipe ceremonies and sweats and stuff. But the undercurrent stuff…the things that in Canadian society just didn’t fit in was something that permeated everything in my own life. And even today, it is part of that reality of how, “Are we accepted?” And certainly people can say we are, but there still is ignorance out there in terms of what we mean when we talk about being custodians to Kikâwînaw Askiy, Mother Earth. Here on the Okanagan Territory, their journey and of course the En’owkin Centre and the work that they’re doing here with their arts program, visual arts program, performance art, is an opportunity for young artists and story tellers to find a safe place to begin developing those narratives within them. This play for me is that. That I’ve had the space here with Vancouver Moving Theatre to create and to help create what the story is about, so I’m really honoured that that’s what brought me here. Do you have anything that you would like to say to the youth that might be seeing this show? You talk about the pulse of youth within the show, is there anything that you would like to pass onto them? I cannot speak for anyone, especially our young people and what they are experiencing with changing climate in the politic of this country, the politic of recognition, the politic of our relationship with our communities and our families. 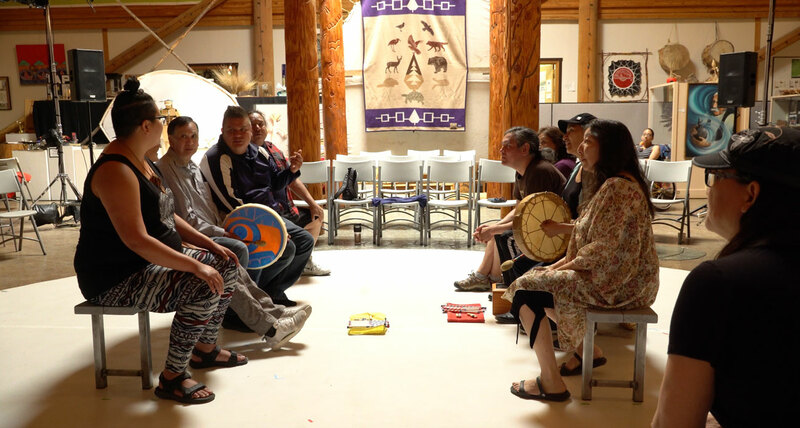 We’ve had a lot of challenges in my generation and people that are in their 50’s in trying to find our voice, because of residential schools and all of that stuff, but now we have a resurgence of voice that’s coming through in a multitude of ways. Whether it’s economic development, education, social justice narratives, entertainment or cultural practices that our young people are taking up, and it’s a beautiful thing. You know, it’s a beautiful thing. And so, my hope is that for people to come to see this show here in Penticton, that the voice of Madeline Terbasket and Savannah Lois are their own voice in how they interpret their cultural world view, and finding that balance between who they are as Syilx, and who they are as members of this society we call Canada.